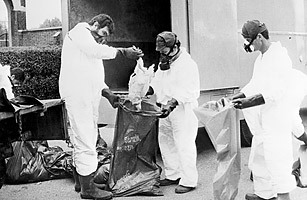 On July 10, 1976, an explosion at a northern Italian chemical plant released a thick, white cloud of dioxin that quickly settled on the town of Seveso, north of Milan. First, animals began to die. As TIME wrote about a month after the incident, "One farmer saw his cat keel over, and when he went to pick up the body, the tail fell off. When authorities dug the cat up for examination two days later, said the farmer, all that was left was its skull." It was four days before people began to feel ill effects  including "nausea, blurred vision and, especially among children, the disfiguring sores of a skin disease known as chloracne"  and weeks before the town itself was evacuated. Residents eventually returned to the town, and today a large park sits above two giant tanks that hold the remains of hundreds of slaughtered animals, the destroyed factory and the soil that received the largest doses of dioxin. See TIME's story on returning to Seveso two years after the disaster.